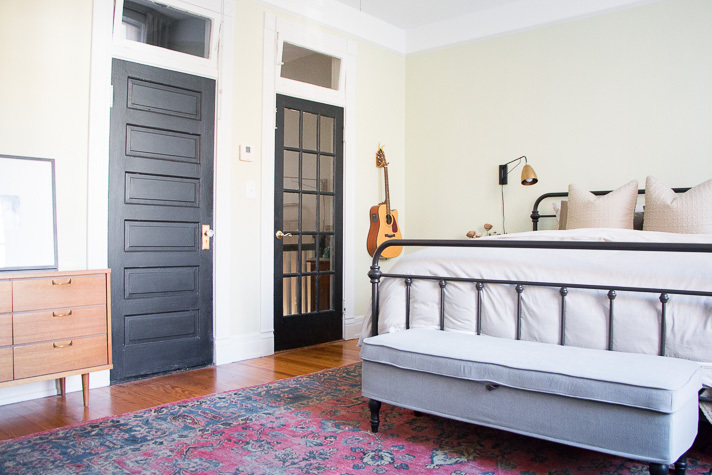 Over the past year we've undergone a series of restorations and a full redesign in our master bedroom — and we couldn't be more excited to say this space is finally complete! Can you hear the excitement? 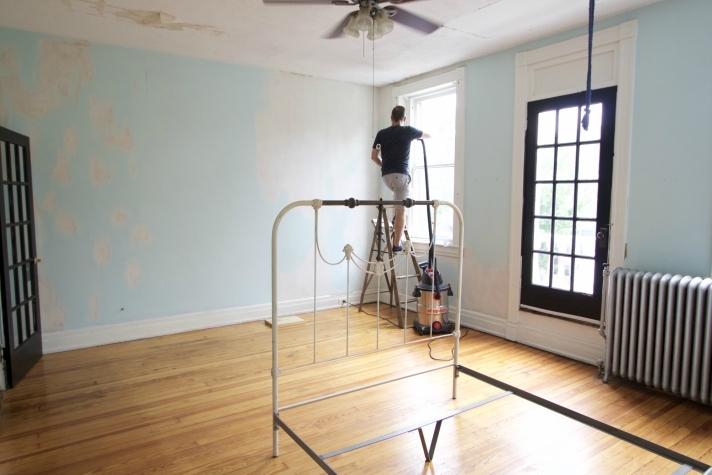 If you're curious (or just want to see some good "before" pics), we detailed the entire restoration bits of the room in this post and created a mood board with all the background details on the inspiration for the design in this post. We wanted a space that felt like a mini retreat with a combination of modern mixed with cozy and collected style. This room is the largest in our home, extending the full width of the front the house, which gave us a lot of space to work within and areas to define. 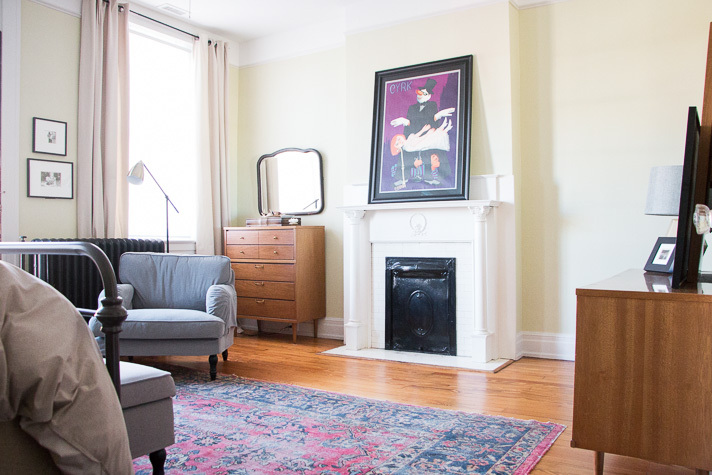 There were a few key family pieces with a special place in our hearts that we ended up building the rest of the room around, like Tim's set of mid century dressers from childhood and the antique rug I grew up loving from my grandparents' family room. 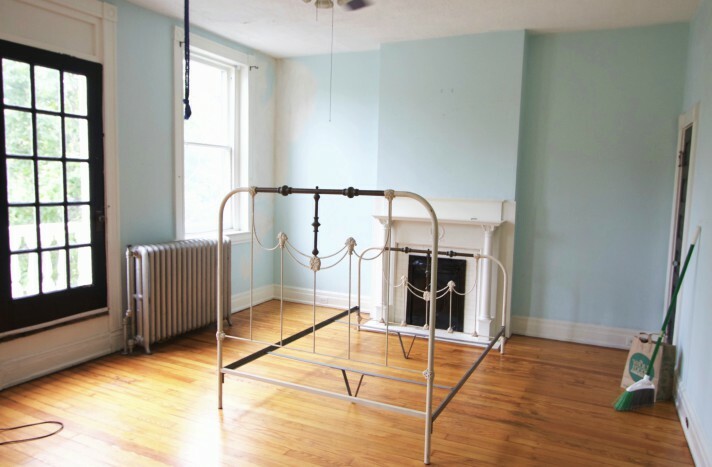 As for the rest of our older bedroom furniture, we mainly repurposed pieces in new spots around the house except for a pair of dressers we sold on Craigslist to a young couple with plans to revive them in chalk paint to match the decor of their farmhouse. 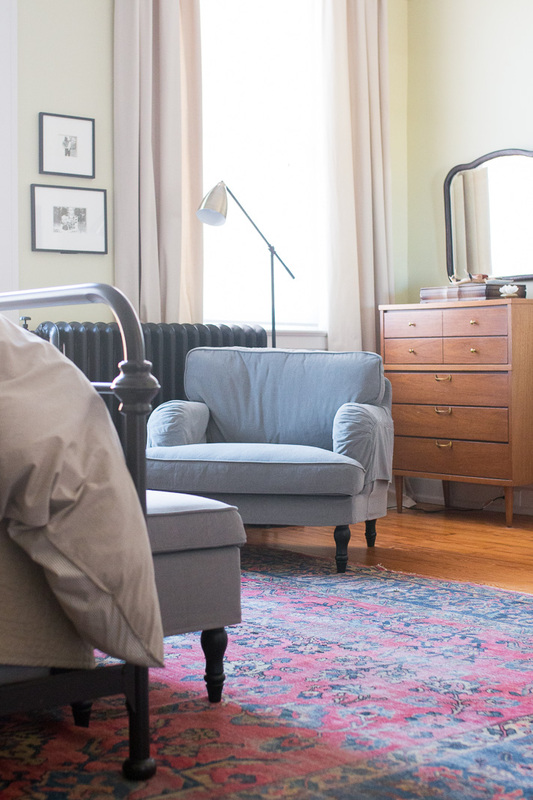 We took the plunge and opted for a king size bed since the room can accommodate one and brought in additional seating in the form of an upholstered bench and a super deep arm chair. Both of these came from Ikea's STOCKSUND collection and play up that cozy lived in vibe we were hoping to layer in. The bench doubles as storage and has been great for a quick seat to pull shoes on (and keeping it real, stacking folded clothes on instead of putting them back in drawers for a couple days). You might remember I'd drawn heavy inspiration for the corner of our room from a couple of sources — the first being this image from an Ikea catalog that closely mimics the layout of our room down to the position of our radiator and the second being this styled room that shows how nicely a chair and a dresser can play together with a corner window. 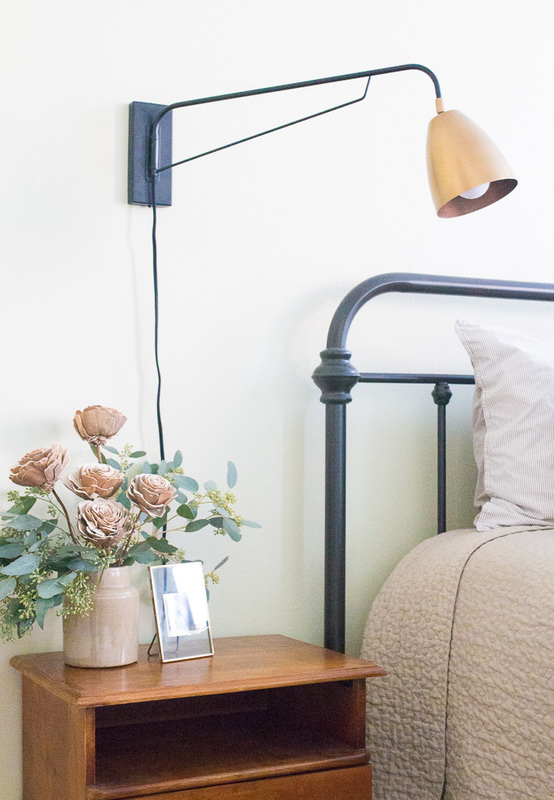 We found the floor lamp at World Market and like the way it works to tie the modern pieces together along with the other notes of black and brass we have going on throughout the room. For finishing details in this corner we hung some of our favorite black & white family photos on the wall and I painted our radiator is a black satin hue. 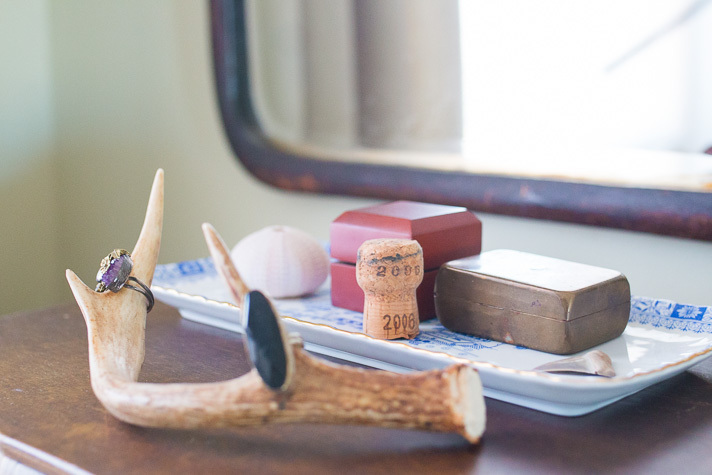 The mirror above the dresser came from my grandmother's home; the dark wood frame pairs well with the dark finish on the antique silver box I use to keep small treasures and collected mementos. Overall we're both so pleased with how this side of the room came together and I find myself curling up in the chair more often then I imagined to play guitar or for phone chats in the mornings and weekends. Shifting to the other corner of the room (on the flip side of the mantle) we have a sliver of wall space between two doors where the second of the two dressers fit perfectly. Each of those doors leads separately into a closet and our master bathroom. The matching mirror for this dresser would have originally been hung horizontally over the piece, but we decided to lean it in a vertical orientation. 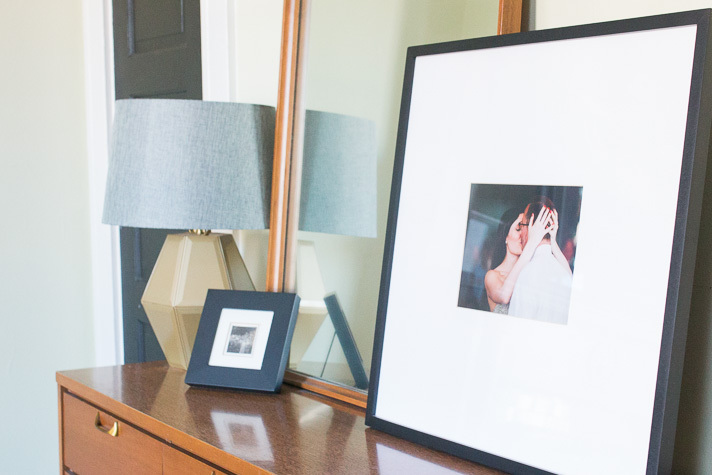 Doing so gave us more of a full length mirror option and allowed more space to layer in some of our favorite photos — like this more intimate shot from our wedding. 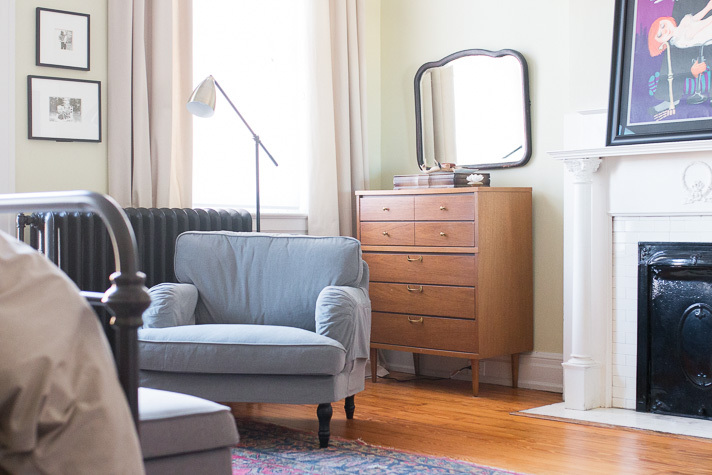 You may have noticed that this dresser is also where our geometric lamp landed. 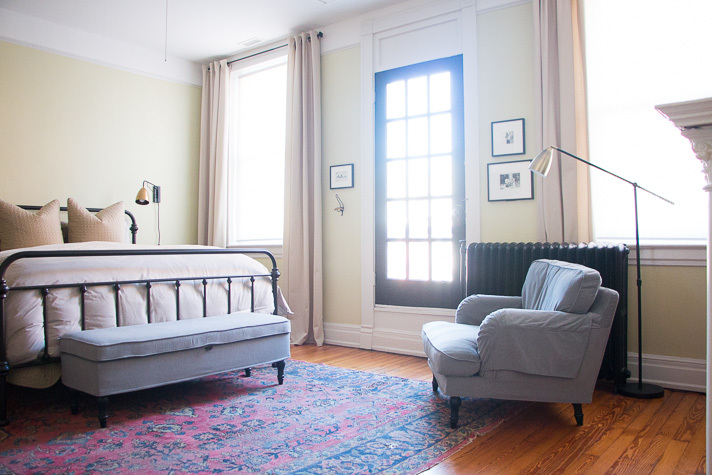 We love how it ties right in with the other pops of gray and brass throughout the room. A while back, we made this lamp from an older, outdated hanging light fixture. 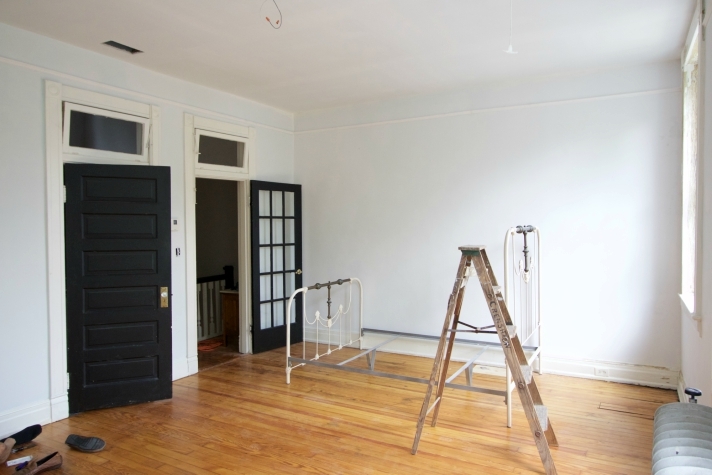 Check out that project with before & after pics right here. Zooming out a bit, here's a wider view of this entire side of our bedroom. 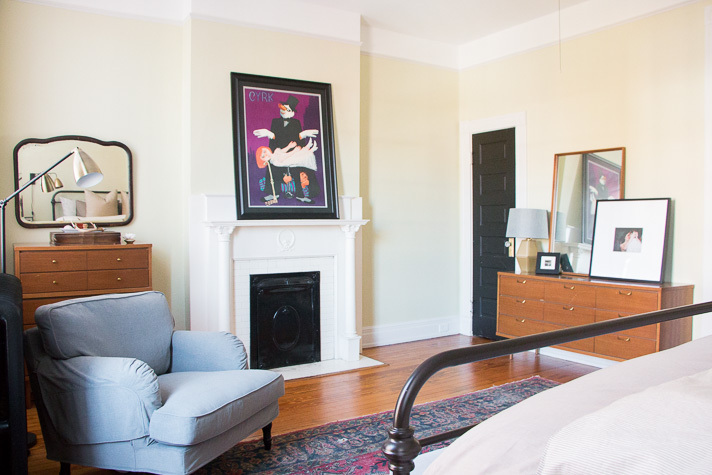 We're really happy we ultimately installed the line of picture moulding along the ceiling and feel like it adds to the existing historic character the mantle and trim bring. The artwork over our mantle is an original CYRK poster from the 70's we sourced at a local auction and had professionally framed. It's from the Polish circus magician series and we just love the touch of character and unexpected pop of color it brings to this space. 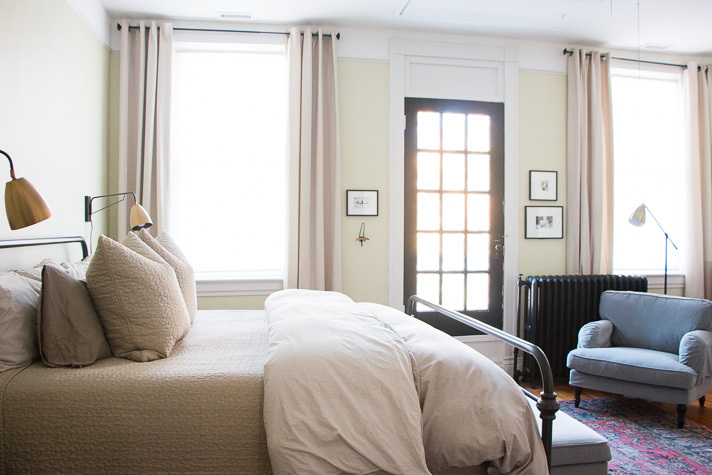 Turning around to the other side of the room, we tried to create some consistency in the color palette by focusing on neutrals for both the bedding and curtains — both of which we found at Ikea. 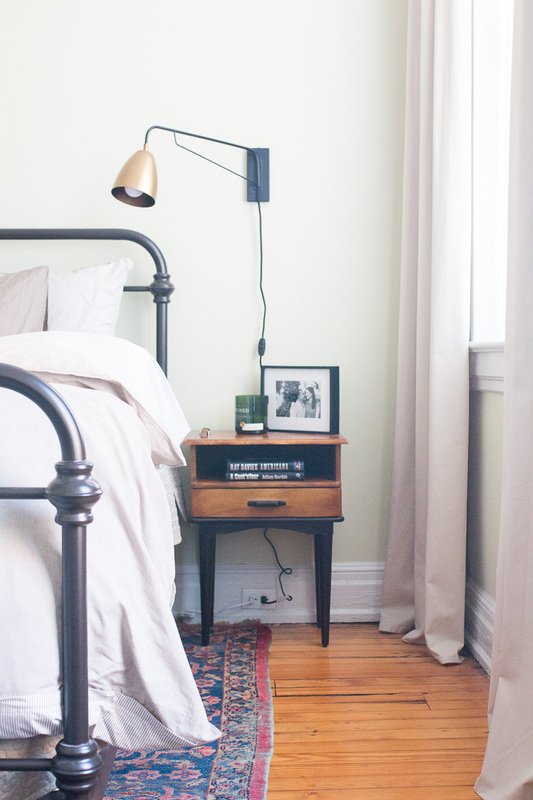 The bed is a king size iron frame I'd found over a year ago that I loved in both style and price. I remember the first week we slept in the new bed we felt like we were miles away from one another, and now we feel like it'd be hard to go back to anything smaller. Our bedding combines a coverlet and duvet set, each with matching pillow covers. We stuck to a neutral color for both but chose different patterns and textures to play up the layering. That brings us to the lighting. 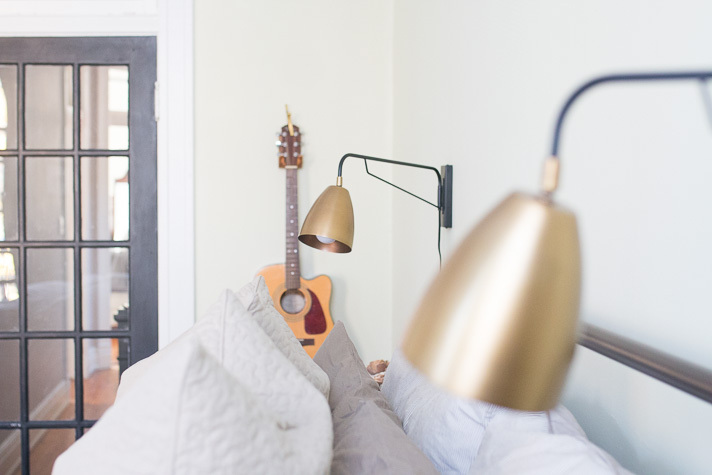 Can we just take a moment to gush over these sconces? 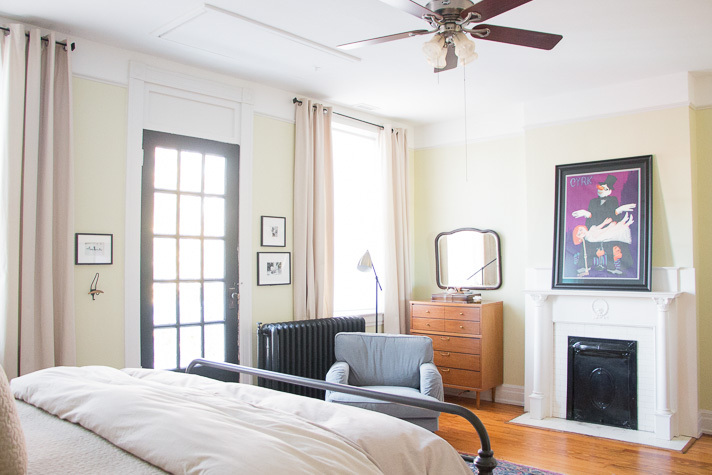 I'd never considered wall sconces for a bedside until planning this room and am so glad we took the risk. 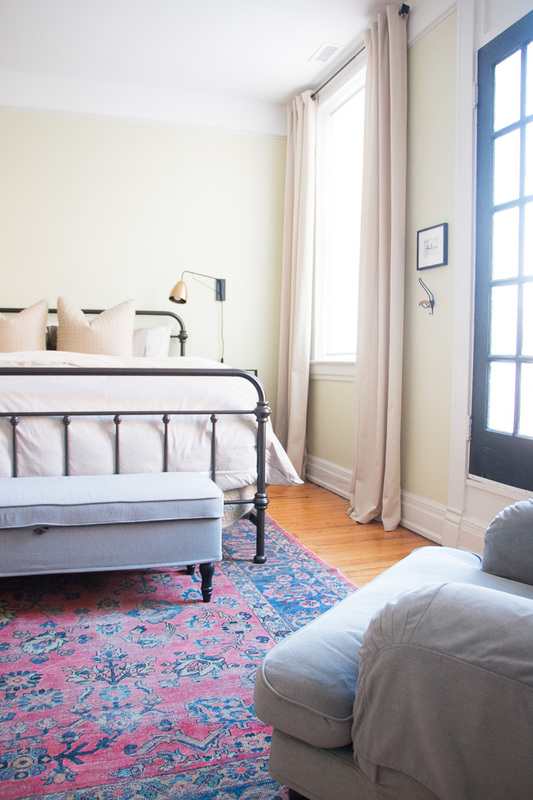 I got the idea after seeing how Julia & Chris styled their guest room earlier this year, which happened to have the exact bed frame and a similar rug to our antique version. You could call it a lightbulb moment (<---- see what I did there). One thing I've tried to be more intentional about this year is playing guitar. In a past life, my world centered around music. Currently, it's a simple pleasure I equate to "me time." 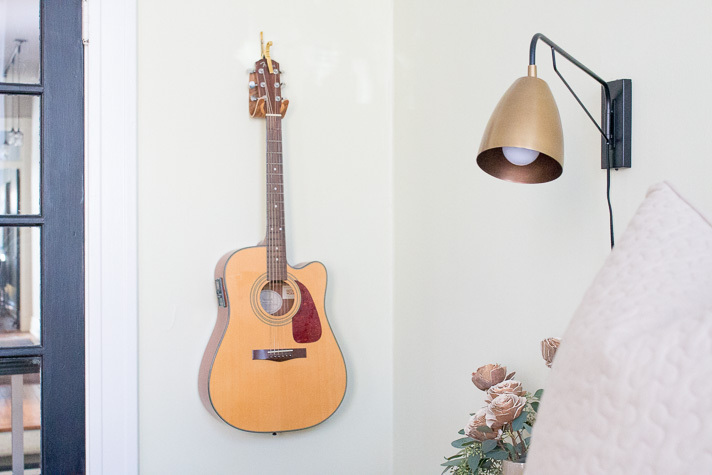 In order to motivate myself, Tim helped me hang my guitar on the wall so it's top of mind. 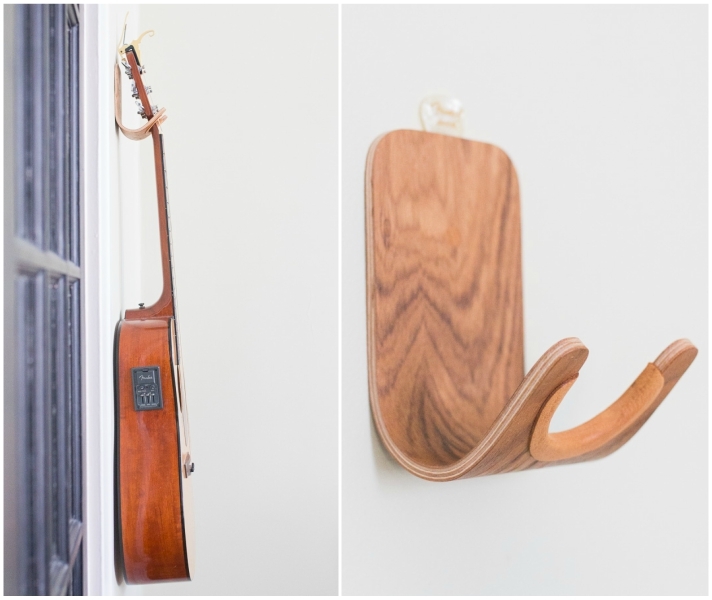 The wall hook is a beautiful modern design by One Forty Three, crafted from customizable plywood and leather. 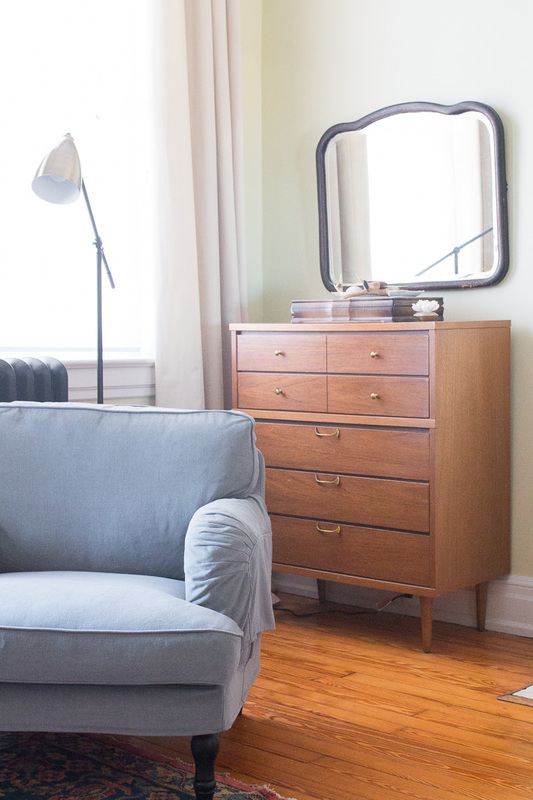 I opted for a teak finish to match the mid-century dressers and nightstands. It even comes with a little slot at the top to store a guitar pick when not in use — how clever is that? 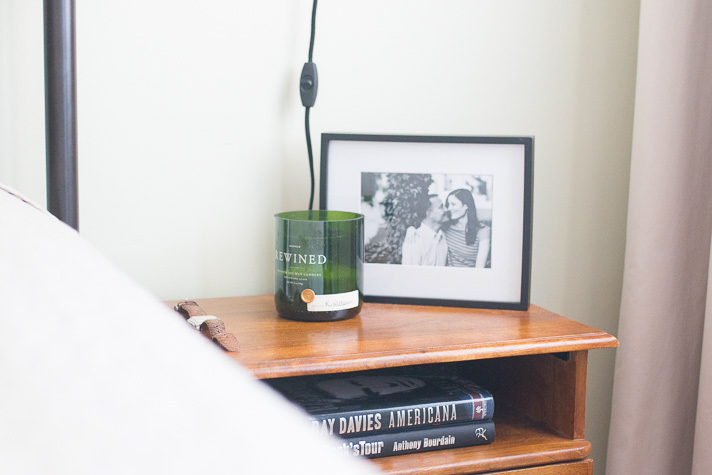 My bedside is fairly simple with room to grow. 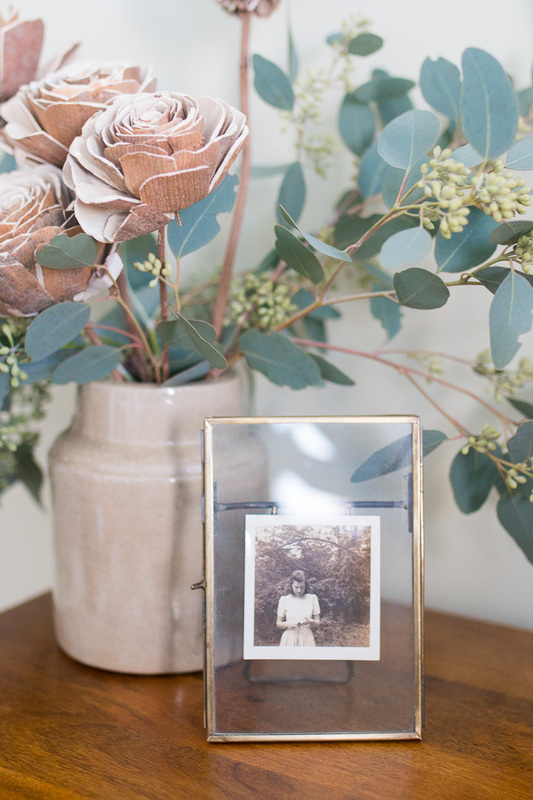 I keep a portrait of my grandmother in a pressed glass frame here and like to bring in various blooms with the changing seasons. 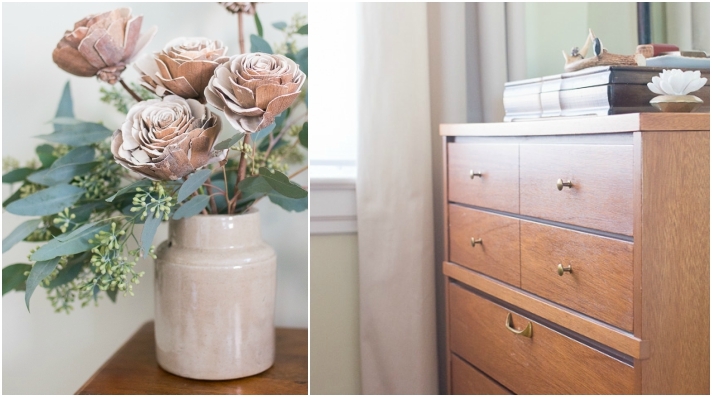 Right now it's a bundle of faux wooden roses paired with fresh seeded eucalyptus. 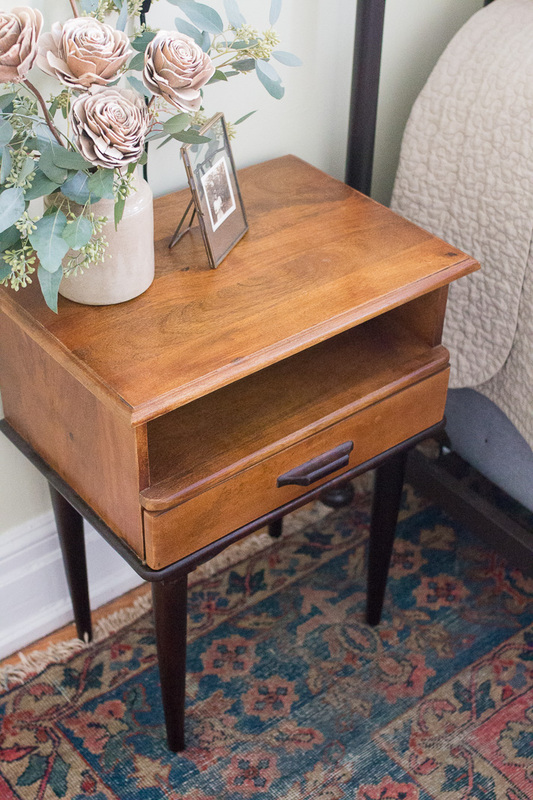 After months of searching for a pair of vintage nightstands to match our dressers, we happened upon the Lars collection from West Elm. 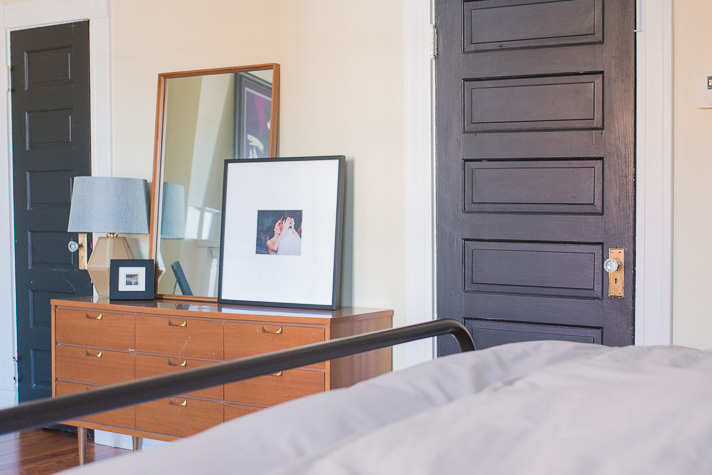 They're new but embody the same mid-century style — and the two tonal wood sent us over the edge since they strike a perfect balance between the teak in the dressers and dark tone of the iron bed frame. It's as if they were made for this room. Tim's bedside holds another one of our favorite photos back from our engagement and a rotation of books at any given time. Right now it's two — Ray Davies (any Kinks fans out there?) and Anthony Bourdain (no surprise there, right?). ...and for good measure, we had to include a pic of how we addressed the attic door in our ceiling. What was once an eyesore with a giant blue rope is now a clean, encased opening with a simple knob. Thanks so much for checking in on us today and humoring us with a tour of our bedroom. 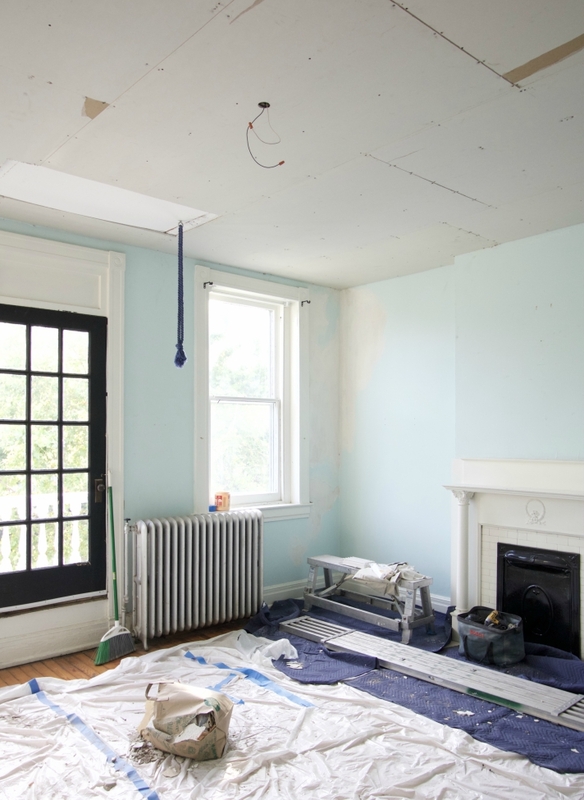 Design and decorating can be such a personal thing, and we've discovered it takes us time to live in a space before really understanding how to unlock it's potential. In general, over the last several years we've tackled a load of restorative work on this historic home of ours — many times learning as we go. It's so nice to be at a stage where we can bring a little more intention into the design of each room with some of the bigger headaches behind us (you know, the kind of work that has to be done for a home to be stable and solid but you never get to see or appreciate?). 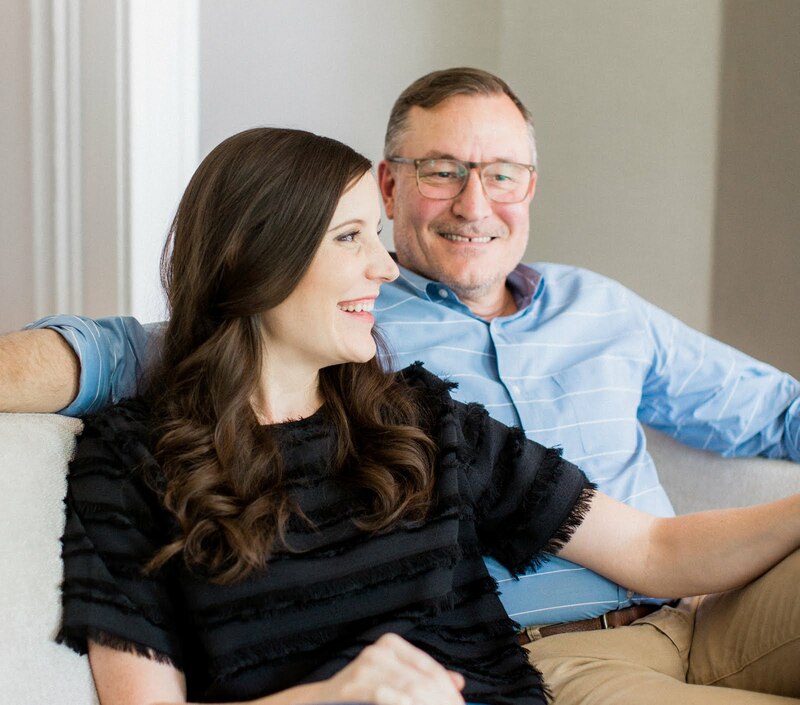 Next up, were already dreaming up ways to rethink our family room which has such a challenging configuration and are making plans to tackle a bit of a dining room revamp just in time for hosting Christmas dinner.